If the Philips Hue smart light bulb is the first connected home product, probably the most desired home networking product is the smart thermostat. While Nest wasn’t the first in the field, it has become the market leader and was purchased by Google back in 2014. One of the reasons why I chose my test home in suburban St. Louis was because the homeowners already had one installed. I wanted to see how it would interact with the Google Home and Alexa Echo units and what other equipment it would integrate with. 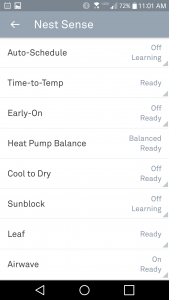 Nest can’t replace all analog thermostat installations, but there is this helpful page that will walk you through what you have now and how your existing thermostat is wired to figure it out. They also have an installation video and troubleshooting tips. My home owners are moderately handy and they had no issues getting it installed. In my informal poll of other Nest users, I didn’t hear any horror stories either. Nest allows this account to grant access to two users with two separate email addresses. You still may want to use a throwaway email address to share among your family, if they have authority to change your home temperature conditions. It connects to your home network via Wi-Fi and like other products, initial setup is via Bluetooth. We set up the Nest with both Alexa and Google Home. Nest doesn’t directly work with Apple’s HomeKit although there is this workaround. We also set up Nest with the ADT Pulse alarm system app that was installed in our test home. More on these connected apps in a moment. Nest calls its product a learning thermostat, and this is because it automatically figures out your usage patterns on a daily basis. For example, the new generation units will light up to greet you when you come home. You can wait a couple of weeks for it to learn your schedule, or set up a typical schedule like any programmable thermostat. But unlike an analog thermostat, it has a series of sensors, as you might imagine. Besides temperature, it also measures humidity, activity and ambient light. That means it can make smarter decisions about your occupancy and usage patterns. That is one of its chief selling points. 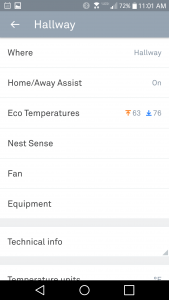 Nest has some built-in routines that help you save money on your heating and cooling bills, called Nest Sense. It has all sorts of automated routines here. One is called Eco Temperatures. Basically, you set up a temperature range that your home will operate at, and if no one is home that is the default mode of operation. 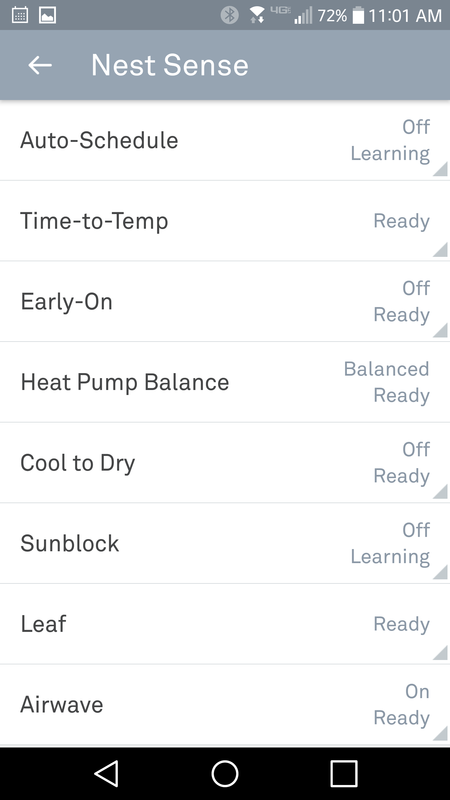 Others are called Cool to Dry, Leaf, Airware, Home/Away Assist, and Time-to-temp. The Nest phone app is cleanly organized and once you get done setting up these various routines, you probably won’t be spending much time with it. With my test homeowners, one said she is so ingrained in using the thermostat directly that when she walks by it in her hallway she thinks about changing the temperature then. The other said he used both the Nest app and the voice commands but still was getting used to using both of them. Part of the issue here is that unlike lighting that you change frequently during the day, you probably don’t think about your home temperature control very often. Another selling point for Nest is that it has a large range of other products that integrate with it. That is what drove my test homeowners to buy it since it works with their ADT security system. 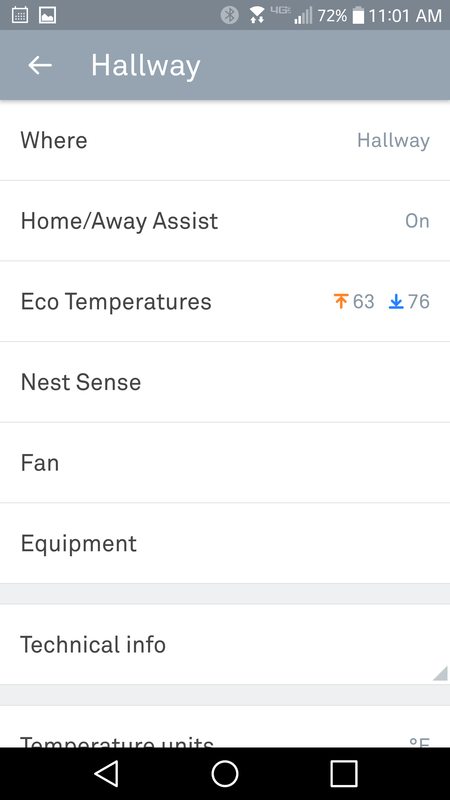 One of my homeowners used the ADT/Nest control because she forgot her Nest app password. So it is nice to have all these different mechanisms to control it, to be sure. Finally, Nest was easy to setup with both the Amazon Alexa and Google Home, taking less than five minutes to get each one configured. Using it was simple too, and both seemed to perform the same way in terms of controlling the thermostat. My male homeowner said he is starting to prefer the Amazon hub for home control, just because it has so many more connected apps. But he finds the Google hub provides him with more thorough answers to his questions. Nest is now on their third generation product, which retails for $249. (I tested the second generation.) But don’t let that price scare you: your local electric or gas utility might have rebate offers. (In St. Louis, it was $125 from both companies combined). It comes in four colors. This entry was posted in digital home, Product reviews by dstrom. Bookmark the permalink.